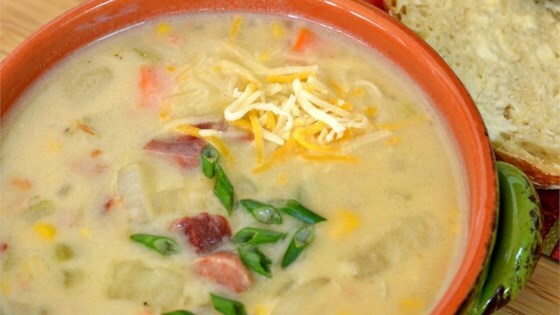 "This is a delicious recipe for ham and potato soup that a friend gave to me. It is very easy and the great thing about it is that you can add additional ingredients, more ham, potatoes, etc., and it still turns out great." Combine potatoes, cauliflower, corn, cooked ham, onion, celery, and garlic in a large soup pot and cover with water. Bring to a boil, reduce heat to medium, and cook until potatoes are tender, 10 to 15 minutes. Stir chicken bouillon, salt, and white pepper into mixture. Melt butter in a saucepan over medium-low heat; whisk in flour to make a paste. Cook for 1 minute and gradually whisk milk into flour mixture until smooth. Continue cooking until thick, 4 to 5 minutes, whisking often. Stir milk mixture into soup and cook until heated through, 5 to 10 minutes. See how to make one of our most popular soup recipes. Bouillon can be broth you have prepped ahead and frozen, and garlic needs to be fresh if you can. Very easy to make hearty delicious soup. Thank you for the recipe. Made this the other night, it turned out wonderful.....and even better the second day! Will definitely be making this again.